The man was not killed in the GIF animation. Why? Water resistance. Resistance not only exist in water, but also in air. It is just that we as human beings have muscles strong enough to deal with the resistance that air imposes on us. Try to punch underwater and feel the difference. Muhammad Ali, who unfortunately passed away 4 months ago, had a famous poster (shown above) of himself in a punching position underwater. 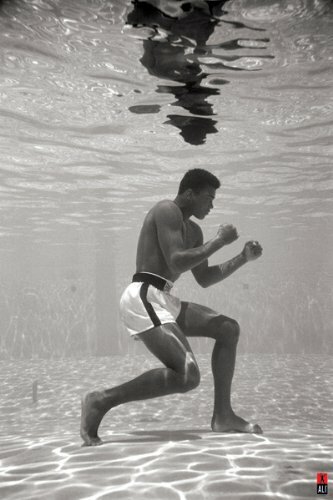 Regardless of their veracity, rumors were that Ali practiced underwater and benefitted from such training. If he were really able to punch underwater at a moderate speed, imagine how much power that would be equivalent to, given the fact that even bullets stop moving underwater shortly after being fired. Whereas k represents a positive proportionality constant, and v denotes the velocity at which object travels. It has a negative sign in this equation because resistance is always acting in the opposite direction of v .
Now trace back to 1st year of high-school physics and think about the projectile problems. What if air resistance is not ignored? What would be the velocity function, then, for a ball released above ground? This is where differential equations come into play. Note that the Greek letter ρ here denotes the ratio between the proportionality constant and the mass of the object: k/m . It is derived from Newton’s second law and the equation for resistance force . Note that in substitution method is used, with the substitution being u = v √ρ/g . The terminal velocity is determined by taking the limit of the velocity function as t goes to positive infinity. It turns out that the tanh function inside the equation above approaches -1 as the time approaches positive infinity terminal speed approaches –√g/ρ . With all that said, you probably already miss the days “without air resistance.” I assume no one would like to solve these differential equations in order to play ring toss games. However, NASA does have a page for a similar problem. To read more, click here. : Edwards, C. Henry, and David E. Penney. Elementary Differential Equations with Boundary Value Problems. Englewood Cliffs, NJ: Prentice Hall, 1993. 88-89. Print. This entry was posted in Math and Technology and tagged Differential Equations, Independent Seminar, physics, westtown school on October 5, 2016 by Max D..
I’m curious how much factoring in air resistance will really change the outcome of most simple physics problem? Last week coffee, this week ring toss and Muhammad Ali were used to help us understand resistance. I assume engineers would use this to consider the resistance of other amounts of gravity encountered in space or on distant planets? Or would it be used to figure out how to get the last bit of ketchup out of the bottle? This example of Muhammad Ali is really good, because I think it interests people who are relatively new to the subject of resistance and velocity functions. Although this is a little more physics related, it would be really cool to see what kind of shapes and sizes objects minimized resistance. How fast did the Red Bull Stratos guy fall when he jumped from space?